Some of the simplest dishes have the most incredible depth of flavour. This classic is one of them. I like to serve it just slightly warm. Too warm and it becomes overly salty. 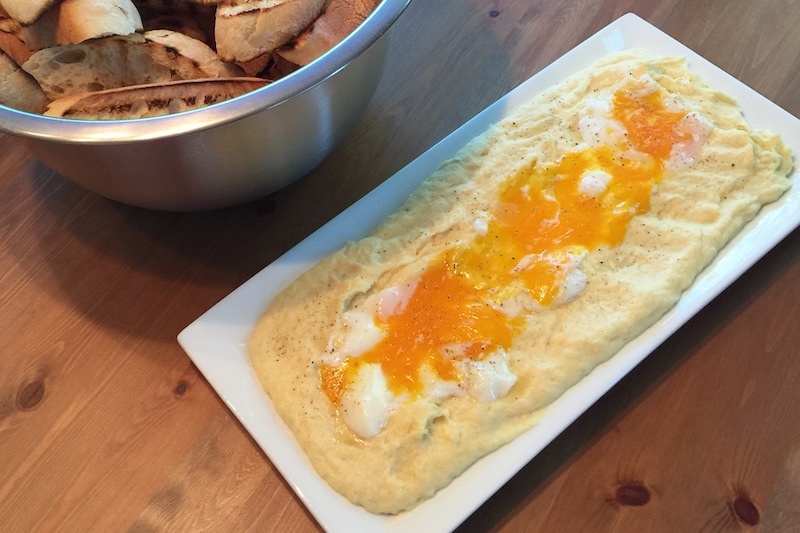 I topped it with a few 63 degree celsius eggs because it looks nice and the texture of the yolk adds another dimension to this incredible snack. Brandade is often spread on pieces of bread, though grain-free crackers would be excellent as well. Soak cod in a large bowl of water overnight. Place potatoes in a large pot and cover with water 2” past the potatoes. Cook on high heat until a boil is reached then, continue to boil for fifteen minutes. Remove the cod from the soaking water and add it to the potato pot. Cover and let stand for fifteen minutes. Place the cod, potatoes, garlic, lemon juice and cayenne in a food processor and process until mixed, yet slightly chunky. Turn on the food processor and drizzle in the olive oil.